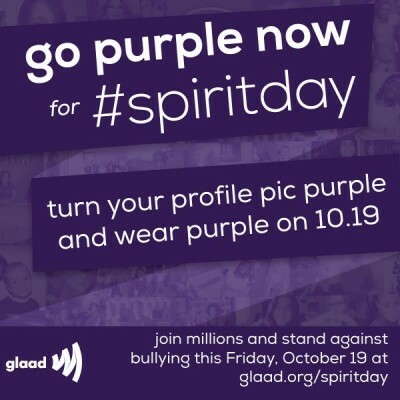 Millions wear purple on Spirit Day as a sign of support for lesbian, gay, bisexual and transgender (LGBT) youth and to speak out against bullying. Spirit Day was started in 2010 as a response to the young people who had taken their own lives. Observed annually, individuals, schools, organizations, corporations, media professionals and celebrities wear purple, which symbolizes spirit on the rainbow flag. Getting involved is easy — participants are asked to simply “go purple” on October 19th as we work to create a world in which LGBT teens are celebrated and accepted for who they are. Learn more.